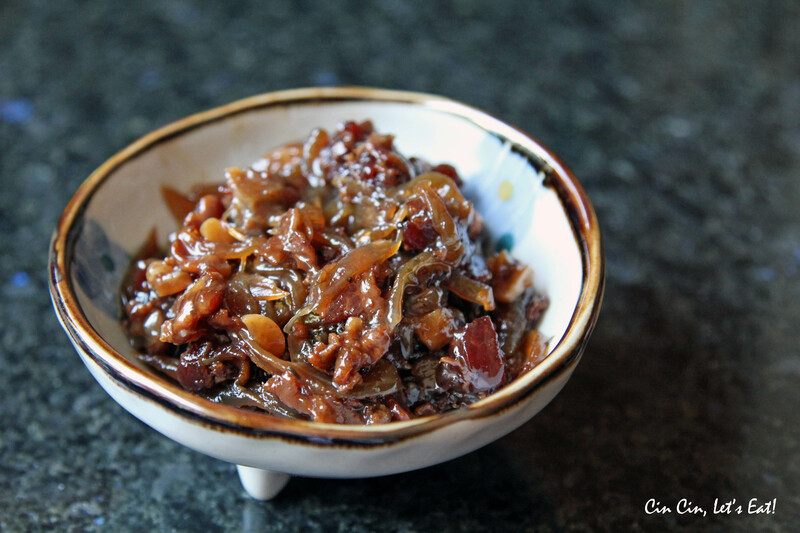 Bacon Jam [recipe] – Cin Cin, Let's Eat! Most people hear the word “jam” and immediately think about strawberry preserve and orange marmalade, how about “bacon jam”? Nothing fruity about that! (Well, except for the addition of apple cider.) What is bacon jam? 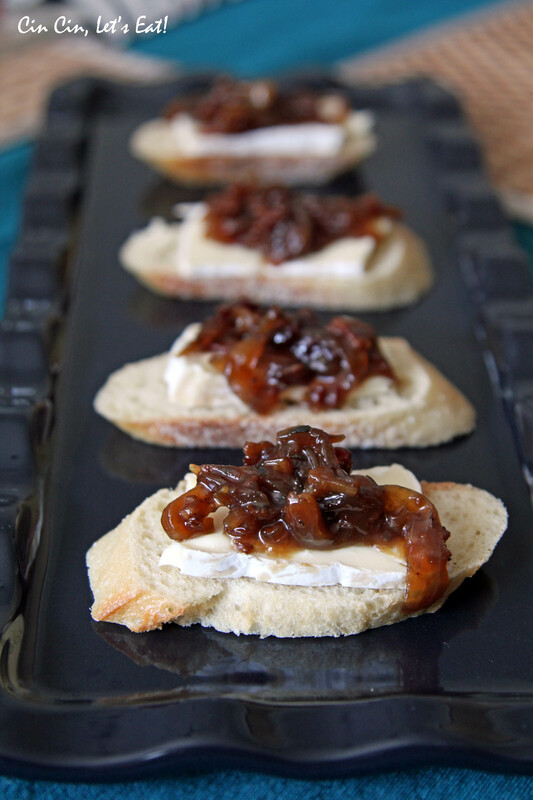 Imagine bacon + onion sauteed, caramelized, and cooked down until they are so soft and spreadable like jam. Put a spoonful of it on top of a toasted slice of baguette with melty triple creme brie… I mean, need I say more? I’ve been wanting to make my own batch of bacon jam ever since I got a jar of it from the market, and I’m so happy that I finally did it. The whole process is very simple, and you can tailor to your own taste and palate by adding different herbs and spices. I especially loved the addition of coffee, no it doesn’t actually make the jam taste like coffee! Instead, the slight bitterness and the nuttiness added depth and body to the flavor profile. The recipe I used is from King Arthur Flour, but instead of cooking it in a crock pot, I used a dutch oven and cooked directly on the stove top. Any large heavy sauce pan will do just fine. And since I didn’t have boiled cider syrup on hand, I simply used homemade apple cider and reduced it down with the bacon and onion. 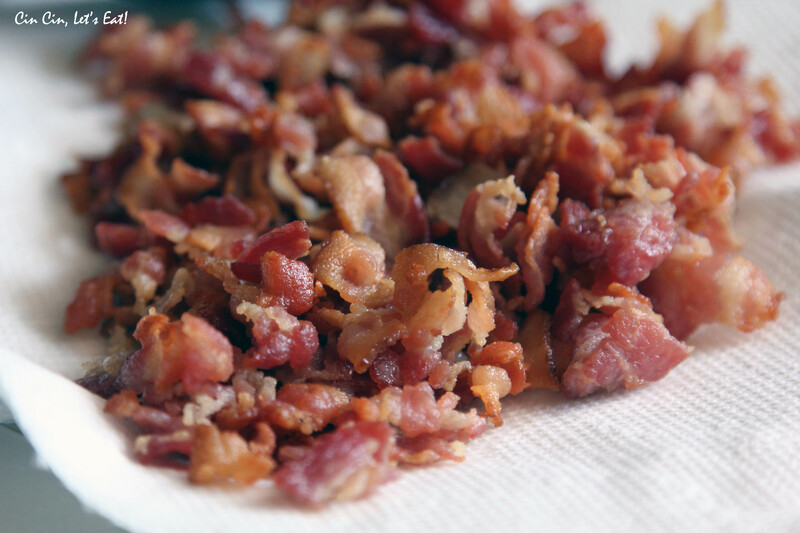 Slice the bacon into 1″ slices and cook in a large sauce pan until well browned and crisped. Remove the bacon and reserve about 1/3 of the rendered fat in the pan. 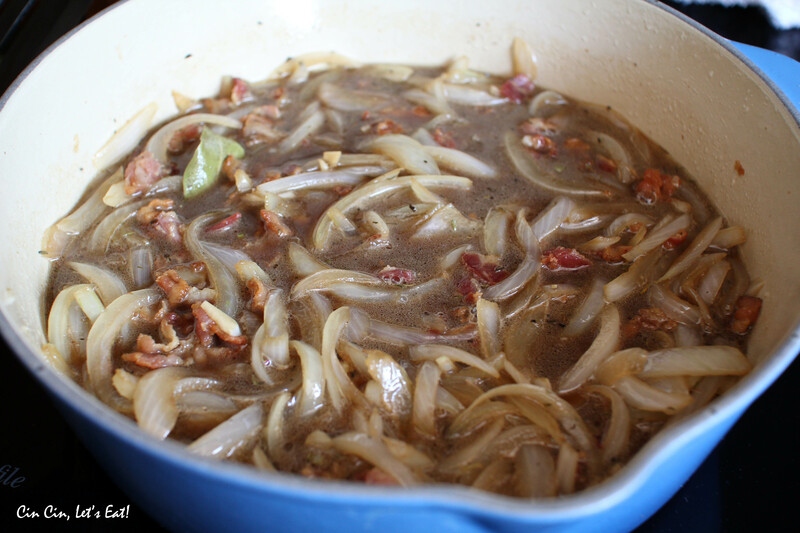 Add onions to the pan and saute in the bacon fat until softened, about 10 minutes. 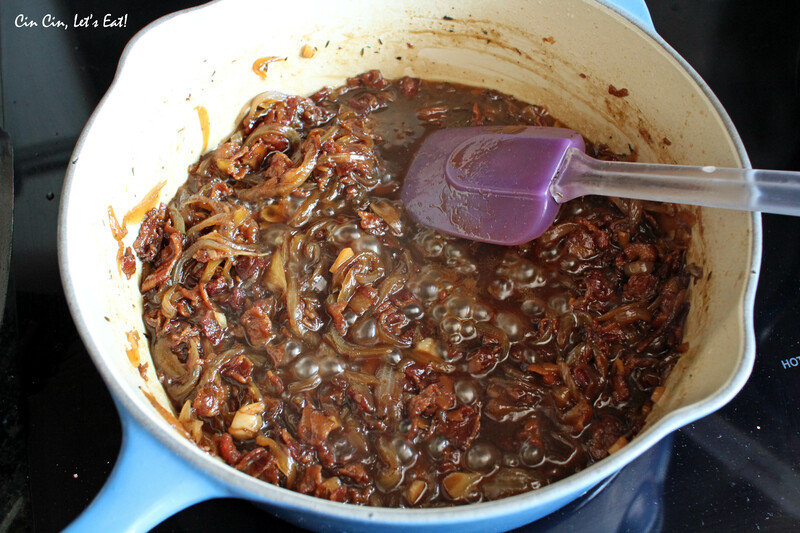 Once all the liquid has reduced and the jam is of a perfect caramelized brown color, fish out the bay leaves. From here you can let transfer the mixture to a bowl or container to let cool, or you like a even smoother consistency, transfer to a food processor or blender and pulse until the consistency is to your liking, a soft spreadable jam. You can leave the bacon in larger bits or pulse until very small, your choice. If you find the jam too liquid for your taste, transfer back to a small saucepan and cook over medium heat until the liquid has evaporated and the jam is thick and syrupy. Adjust the seasonings and serve warm. Store airtight in the refrigerator for up to 2 weeks. Warm in the microwave before serving. Simmering away. Oh the wait was torturous! ALMOST DONE!!! 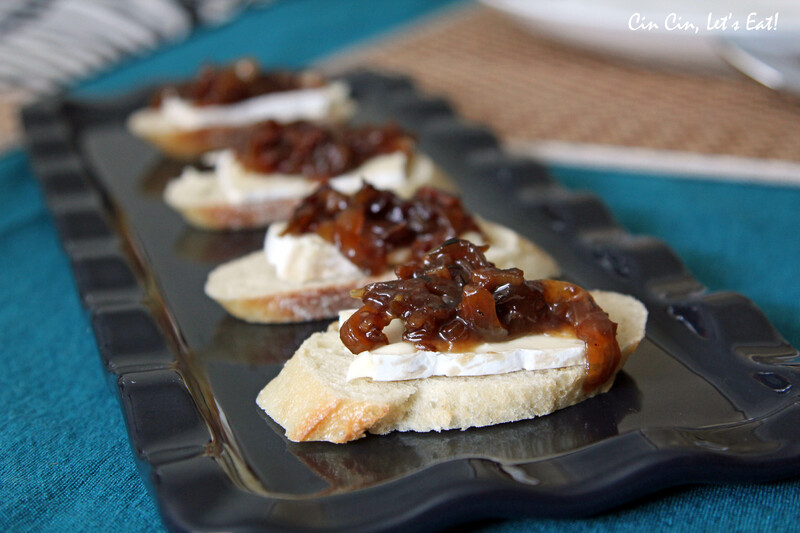 There is something about caramelized onion, so sweet and syrupy! I liked the jam chunky so I didn’t run the mixture through food processor. How good do these look? I can eat these for breakfast, lunch, and dinner. You can use the jam in all kinds of cooking. I added it to omelet, pasta, soup as toppings, salad, sandwiches…etc. Enjoy!! !